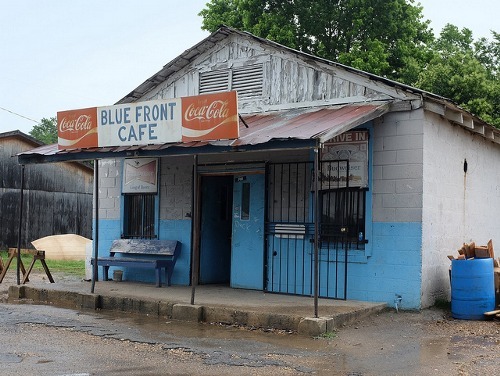 The Blue Front Cafe is a historic old juke joint made of cinder block in Bentonia, Mississippi on Highway 49, approximately 30 miles northwest of Jackson, which played an important role in the development of the blues in Mississippi. Along with the Riverside Hotel in Clarksdale, where bluesmen such as Robert Nighthawk and Sonny Boy Williamson II spent the night and Stovall Farms, home of Muddy Waters before he headed north to Chicago to find fame and some fortune, the cafe has been given a marker and officially placed on the Mississippi Blues Trail. The Blue Front Cafe is a true remnant of the past — a virtual time machine evoking the strain of blues created by Jack Owens’ hauntingly, slow style of blues guitar. The counters are covered with vinyl. Box fans stir a warm breeze. An old jukebox gathers dust. Cigarette butts fill the ashtrays atop wooden tables that are paired with resin lawn chairs. And on the walls are the ghosts. The largest being a photograph of Owens himself, an old man holding his instrument close to his heart. The rest are snapshots of those who pioneered the music that best captures the hopes and heartbreaks of the poor man and the land — such as Son Thomas and Muddy Waters. The cafe has been in the family of Jimmy “Duck” Holmes since 1948 and is considered the home of Bentonia blues, a playing style made famous by Owens and his contemporary, Skip James. Experts describe the Bentonia sound as a minor-tuned, acoustic country blues sung in a near falsetto. Located in the southern portion of the Mississippi Delta in Yazoo County, it provided a focus of entertainment for the field hands from the surrounding cotton plantations who gathered at the Blue Front Cafe for drinks, relaxation and great music.